A look into where we’ve been and where we’re headed when it comes to Hakai archaeology. Archaeology has been an integral part of the Hakai Institute since construction began on the Calvert Island Ecological Observatory back in 2009. Since then, archaeologists working on the BC Central Coast and on Quadra Island have done extensive research and contributed a great deal to our understanding of human migration down the Pacific coast during the last ice age. Major highlights include the oldest footprints found in North America, excavations at a village on Triquet Island dating to more than 14,000 years ago, and a five-year effort on Quadra Island to piece together 13,000 years of coastal living. 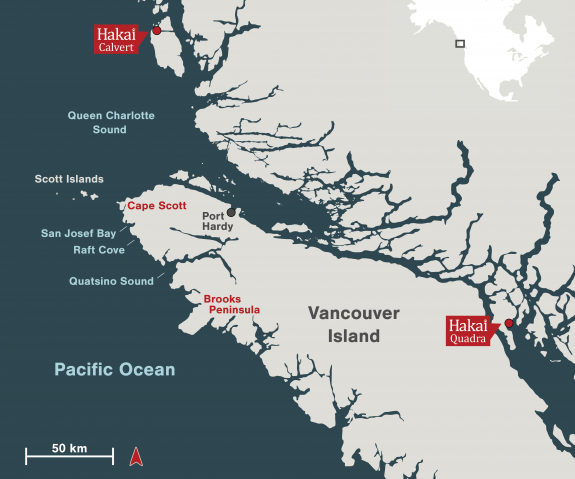 Archaeology projects at the Hakai Institute are continuing, but are going to be focused on a new region—northern Vancouver Island. Hakai executive director Eric Peterson goes in-depth about the history of archaeology at the Hakai Institute and the next steps in his latest short podcast. If you are well-versed in the history of Hakai archaeology, you can skip ahead to 4:22 to hear about where the research is headed.